If you’re a small business trying to increase your reach and brand equity, look no further than Pinterest. While Pinterest may not necessarily come to mind when you think business growth and sales conversions, it should. There are countless statistics that show the power of the pin and how small businesses are leveraging their brands on this social media platform. With this kind of conversion and exposure to new audiences, Pinterest is a must-have for small business. However, every business owner has limited time and adding more marketing activities isn’t likely, but trust us: Pinterest is worth the investment and we’ll show you how your business can boost its brand reputation and grow its target audience in no time. 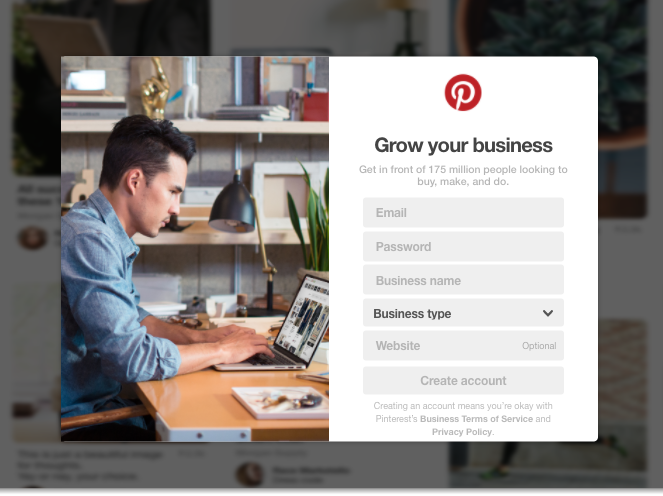 First things first: you need a Pinterest business account. It’s especially important to separate your personal account and business account if you’re looking to grow your brand on Pinterest. Your business account should reflect your company’s aesthetic, interest, and industry, and we’re willing to bet your personal account has a different feel, vibe, and board topics than your company. It takes minutes to create your login and profile, and from there you can work on creating your content strategy and maximizing your reach (which we’ll get to later). Simply go here to create your business account. One thing to remember is that if you have other social media profiles, such as a Facebook for Business page, a Twitter account, or Instagram account, it’s a good idea to claim the same handle. For example, if your business is Mike’s Mechanic Shop, and your social media handle on Facebook and Instagram is @MikesMechanic, see if that account name is available on Pinterest for continuity. Having the same (or similar) social media handles helps establish brand equity and trust in your small business. A caveat is that Twitter has a character limit (of course), so you may need to tweak your Twitter handle to fit their requirements. As long as all of your social media profiles seem connected, you’ll make a good impression on prospective customers. This is a first step in building a trustworthy brand presence. Small businesses often overlook the bio portion of their Pinterest account. Your bio information can do wonders for attracting new followers and exposing your pins to relevant audiences. First, populate the profile image, whether it’s with your logo or a photograph. If you’re wondering what to put there, look to your other social media profiles and a good rule of thumb is to use the same profile image across all profiles. Again, consistency counts when you’re looking for brand growth. Once your profile picture is complete, include your website URL, other social media handles, and a quick business summary. Referencing your other profiles will help you fill out these elements of your Pinterest bio. Including your location – or areas where your products or services are provided – is incredibly important. Pinterest searches tend to include locations, so by including your region or territory, it means your account and pins are more likely to show up in these location-based searches. It’s a simple (and free) way to expand your brand awareness and get new followers! People love Pinterest because it’s so easy to use and you can switch between topics and boards quickly. However, that doesn’t mean your business should use Pinterest in a haphazard way. Just like your other social media marketing strategies, your Pinterest content needs to be thoughtfully curated to engage your followers and attract a bigger audience. But where do you start? There are best practices to follow if you’re building your brand on Pinterest. First, you must understand what your target audience wants, and better yet what they don’t even know they want. If your business does residential painting (exterior and interiors), create boards that showcase before and after images of rooms that have been transformed with a coat of paint. This gives your followers inspiration, and that’s the name of the game when it comes to Pinterest. Aside from understanding the different topics and categories your followers are looking for, your business account should have about ten boards (12 is ideal), and those boards all need at least five pins each. They need to look full and organized. With your boards in place with relevant and compelling pins, your business looks like a reputable brand. You’re not solely pushing your product or service, but providing vision and new ideas, which is why people use Pinterest. When people see your Pinterest account as aspirational, useful, and valuable, you can bet your brand awareness and credibility will soar. Let’s not forget the reason you have this business account: to find new leads and increase your industry authority. It’s important to link to your website – whether its individual products or services, or even a specific landing page. A solid Pinterest content strategy will drive website traffic and conversions, but that only happens when you give people a place to go from your pins. In the same vein, include helpful and informative captions on every pin. Use specific keywords and search terms in your captions to increase the chances of your pins showing up in search queries. This is precious real estate that can broaden your follower base and build on your brand’s credibility. One of the most interesting things about brand equity is that potential customers and consumers becoming familiar with a brand through ambient interactions, such as showing up in search results. You want your pins to rank highly for keywords related to your industry. Incorporate these terms into as many captions as possible to drive your brand awareness. Pinterest images are completely different than any other social media platform. To successfully pin for your small business, you need to pin vertical images instead of horizontal ones. Just think about your personal Pinterest feed for a second; the pins that initially catch your eye are the long, vertical pins because the images stand out. In fact, the ideal pin size is 736 pixels x 1104 to 2061 pixels. Beyond the size of the image, it’s important to choose images that evoke specific feelings from the viewer. Each pinned image acts as the magazine cover for the caption and website link that are attached to it. The cover draws the viewer’s attention and moves them to click and learn more about the pin. Even though everyone loves a stunning image, Pinterest users respond the best to pins that include an image with text overlay. By using text overlay, you can clearly articulate what the viewer can expect from clicking your pin, such as “10 things you need to organize your home office.” That means you can use more clever and witty language in your captions. And speaking of captions, your caption is what takes your followers from opening your pin to taking an action, like visiting your website. To get the most conversions from your pins, try including a call to action in your captions so your followers know what you’re expecting of them. These image components are what you need to build your brand on Pinterest. They help your followers understand what you’re offering, and just as important, your keyword usage and links to your website improve SEO rankings and website traffic. These are essential elements that will help your brand and make you a Pinterest all-star. Pinterest is a powerful branding tool that can take a business far without a major investment of time and resources. Consider these four branding tips to get your Pinterest account up to snuff and generating new followers and leads in no time. With a little work on the front end, your Pinterest efforts will pay dividends for years to come as your brand, when actively maintained, continually increases in value, awareness, and equity. Best of luck and happy pinning! Julie Chomiak is a freelance writer who is experienced in digital marketing, content marketing, small business, event planning, branding, productivity, social media, and SEO. Follow Julie on Twitter and read more of her articles here. While there is no doubt that Facebook can be a game changer when it comes to advertising, running a successful ad campaign on this platform is not easy; it comes with its fair share of complexities. Just like with other forms of advertising, you also have to think about your audience and come up with ads that your audience can identify with. Below we discuss tips on how you can run a successful ad campaign on Facebook.